Set of 2 Political Maps - World & U.S. 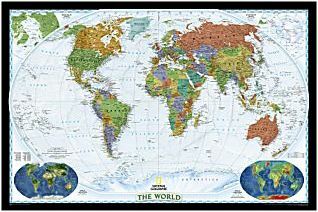 This laminated map has spectacular color and detail to bring the world alive! Enjoy the accuracy and beauty of this world map, which features the Winkel Tripel projection to reduce distortion of land masses as they near the poles. Temporarily Unavailable while we work with National Geographic to provide an affordable wall map set. 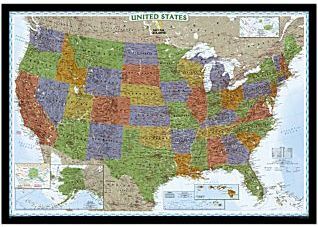 This brightly colored and laminated U.S. map is designed for easy identification of each state and its unique urban and physical geography. It's a great resource for getting young explorers excited about geography.